Wind, Storm & Flood | Water Damage Contractors Alabama | DE General is the Southeast region’s premier disaster restoration company for both commercial and residential losses. There is nothing more heartbreaking than to step into your home or business and find wind driven storm or water damage. It is essential to act fast in these debilitating situations. With our 24 hour, 7 day emergency service, DE General can mobilize and be on the scene in a few hours in most areas. We offer our clients state of the art water extraction, drying, and dehumidifying services ranging from carpet drying to wet carpet removal and contents recovery; all backed by a fleet of specialty vacuums, dehumidifiers, air movers, air scrubbers with HEPA compliant filtration, and the trucks to move them. 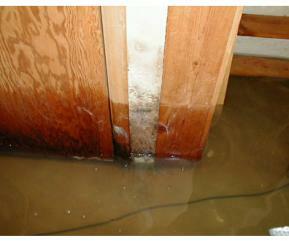 Molds are fungi that can be found both indoors and outdoors. No one knows how many species of fungi exist but estimates range from tens of thousands to perhaps three hundred thousand or more. Molds grow best in warm, damp, and humid conditions, and spread and reproduce by making spores.